Have you got Florida Rd knowledge at your fingertips? Do you know where best place to go for late night dining is or where to get your nails done? How about the number for the UIP 24/7 hotline number, or what’s on the First Thursdays line-up? 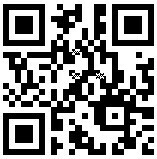 If not then you need to download the FREE Florida Rd area APP by scanning the code below or searching your APP store. Responding to the times we live in and the need to have information, literally, at our fingertips, Florida Rd has developed a unique area-based APP FREE to download from all APP stores. 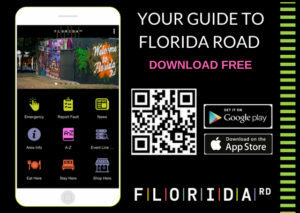 The APP aims to enhance the experience of Florida Rd for visitors, businesses, residents and tourists, by providing a single ‘go-to’ point for all local information. Comprehensive and user-friendly, the APP groups similar content together making it easier for people to access the exact information they need. The comprehensive A-Z, lists every business in Florida Rd with a click-to-call phone number, while the Eat, Shop and Stay categories feature key offerings in the area. Local knowledge from maps and the history of Florida Rd to information on the local clinic and library is contained in the Area Info section, which is constantly refined and updated. With your safety a priority on Florida Rd, the APP has a one-touch-call link to the 24/7 UIP Hotline Number as well as the option to Report A Fault, by capturing an image and sending an alert for everything from street lights out, to lost pets, directly to the UIP team. The Events section of the APP gives you line up of activities on Florida Rd (as hosted on the UIP website), as well as the option of checking out what is happening in the whole of Durban. Understanding that Florida Rd is part of the incredible city of Durban, and the province of KZN, the APP has a More Durbs section, which using categorized listings gives the user info on everything from Township Tours to Local Markets and everything in between. While businesses in Florida Rd (and the immediate surrounds) are listed FREE under the A-Z, the Eat, Shop, Stay and Property sections showcase upgraded listings, giving businesses the opportunity to show more of what they offer. These upgraded listings are charged at R1 850 (ex VAT) per annum – which equates to R142 p/m! Contact cara@urbanmgt.co.za to list or upgrade. Welcome to the first edition of THE / VIBE – available as a flip book here. You are part of another defining moment in the journey of this unique place, so grab this opportunity and read the launch issue of Florida Rd’s quarterly publication. Developed by the Florida Rd Place-Making Committee and Urban Improvement Precinct (UIP), with input and guidance from the eThekwini Municipalities Transport Authority (ETA) and Economic Development Unit (EDU), this is a space dedicated to serving the dynamic Florida Rd community, a place to share the news and views of the Roads’ food, culture, work, family, design and party happenings, a space to keep in touch about this rapidly evolving place. So, let’s share…and focus because this is the whirlwind summary! We start with hard-core strategy, summing up the Florida Rd brand DNA and urban development programs and sharing some of the key points from this discovery. Some of the influential voices on the road give us their insight into the future of the place, and then we reveal the new Florida Rd visual identity before telling you where to next and explaining how you can get involved. 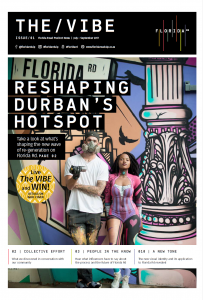 Essentially THE / VIBE is here to re-ignite the fire in those that may have left the road, while delivering on promises made to the die-hards for their commitment to keeping this place relevant and uniquely Durban. Florida Rd is giving away 5 x Florida Rd hampers as a reward for living THE / VIBE. Here’s how to win: With the launch issue of the magazine in hand capture the perfect Florida Rd VIBE moment and share it on Facebook and or Instagram with #floridardvibe. Prize winners will be announced on social media – so make sure you follow Florida Rd. Only comments with #floridardvibe will be eligible to win. All eligible comments will be placed in a magic hat, with 5 lucky commentators pulled out at random. Prize winners will be announced by 2pm on Friday 1st September. Not all the hampers are the same but are made up of a combination of giveaways. Rules of the establishment apply to prizes redeemable there. After more than 18 months of research, surveys, workshops, meetings, participation processes and public engagements, a new Florida Rd brand is ready to emerge, and with it the action plan and interventions needed to help the road reach its full potential as a go-to-place for Durban’s locals and visitors alike. 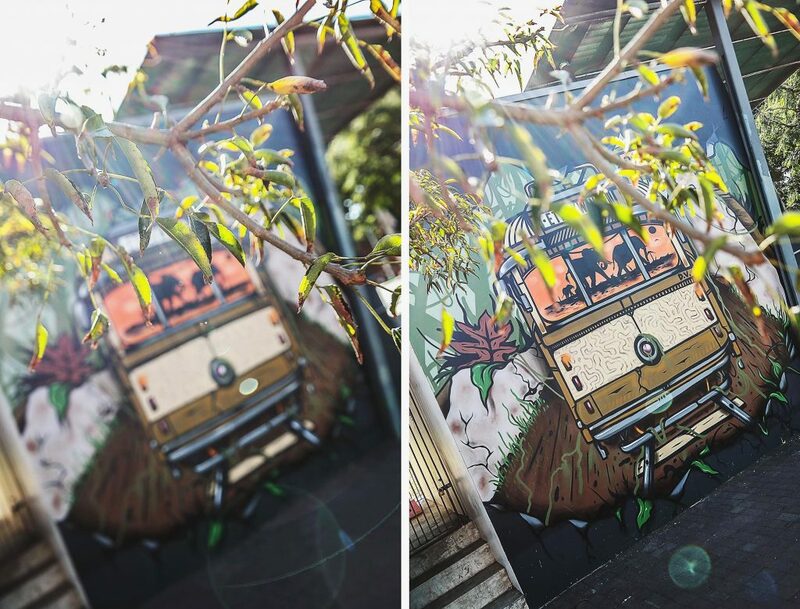 With an authentically urban beat interwoven with iconic snippets of history, both finding their place along a busy thoroughfare, Florida Road is uniquely Durban. Yet despite its history and its people, despite its restaurants, galleries, and bars, by 2013 Florida Road had begun to slide into urban decay, slowly losing its’ reputation as one of the city’s trendiest streets. Thankfully through a collective urban management intervention that saw the creation of the Florida Rd Urban Improvement Precinct (UIP) in late 2013, safety, attention and care have been restored, and Florida Rd is once again poised for change with an inclusive and long-term identity. Initiated in June 2016 by a collective of the Florida Rd UIP and the Ethekwini Municipality’s Economic Development and Tourism departments, Florida Rd took its first steps on a journey of discovering its brand identity. This long and inclusive process looked to uncover the roads true character, understanding who it is and who it isn’t, how it wants its personality to be communicated and the image it would like to shake off. Captured as a new logo and place-making tool for the road, the Florida Rd brand is made up of all the strands in the roads DNA. And it is this DNA that will be used to guide what must be done to unlock the economic potential of the road. Read more about the Brand DNA Process and call for participation. The sense of movement that emanates from the modern Florida Rd was set by a past that saw transport guide the development that today we view as the nostalgic charm of the road. Stretching from Greyville Race Course to Innes Road, it was the development of the tramway system on Florida Rd and around the Berea in general, that moved people into the area, and left us with a legacy of transports firsts and a series of Edwardian buildings, well over 100 years old. Below are a few snippets of Florida Rd’s history. Florida Rd has always been a central route through Durban originally a well-worn elephant track that took the animals on their daily trek for water from the top of Berea down to the Greyville Marsh (now part of the Royal Durban Golf Course). It was along this track that the first private horse-drawn tram service in Durban began on 25th March 1880. The original shelter used as a stop for this service still exists today at the top of Florida Rd. At 137-year-old, this is the oldest shelter of its kind in eThekwini. In 1892 the first municipal tram line in South Africa was laid along Florida Rd, using horses as motive power. On 1st August 1899, the Durban Municipal Corporation took over the service, with the last horse-drawn tram running on 25th October 1903. The shelter was then used as a stop for the Umbilo Service that ran the Electric Trams that first began operations on 1st May 1902. It was then the turn of the double-decker electric trolley buses that began services on 24th February 1935 and ran alongside the electric tram until they ended their services in 1949. The first diesel double-decker buses started on 28 August 1938 with petrol and diesel single decker buses commencing on June 1925. Since then services such as the Mynah Buses, Mini Bus Taxis and the City bus service have made use of the shelter. The tram shelter was restored by the Municipality in February 2017, as part of collective efforts by the City and the Florida Rd UIP to create good quality public open spaces that enhance the experience and functionally of this key node in the City. This shelter is one of 3 left in Durban, with the others in Cowie and Stella Roads. A story-board depicting Durban’s transport history will soon be built into the area around the shelter, making it a destination site that provides a glimpse of the history of Florida Rd and the area. The Edwardian veranda-fronts and elements of cast iron of most of the Florida Rd homes, were selected from catalogues and bolted together on site. The choice of patterns for the veranda pillars are typically Edwardian, complete with base, shaft and capital detailed with foliage, and braced with filigreed brackets and beams. The Elephant house at the top of the Berea dates from 1849 and is reputedly the first house built on the Berea and is possibly the oldest and most historic of the remaining colonial period houses in Durban. When first built, elephants still trampled around the property often damaging parts of the building. 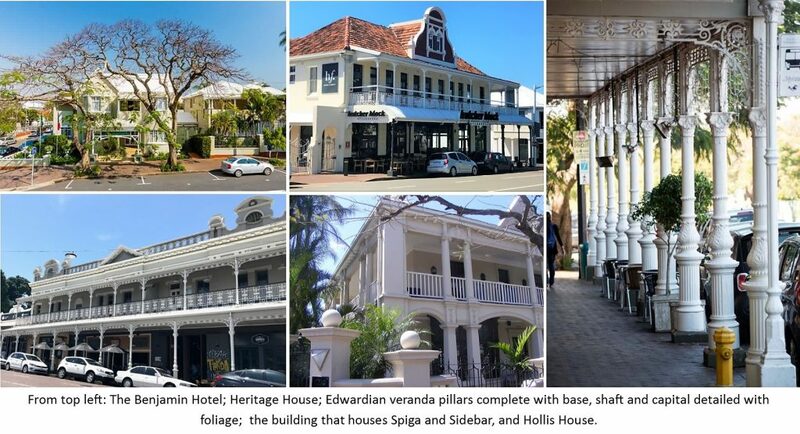 Number 101 Florida Rd is home to The Quarters Hotel and is made up of four beautifully restored Victorian homes. Number 113 Florida Rd is known as Heritage House. Built in 1901 it is now the Durban office of Home Fabrics. Number 178 Florida Rd is a landmark Edwardian house built in Baroque Revival style with arched verandas. Currently home to Velvet Lounge, this building was constructed by Mr Jack Hollis who was a building contractor for the Durban City Hall. Number 200 Florida Rd shows typically Edwardian veranda pillars complete with base, shaft and capital detailed with foliageand braced with filigreed brackets and beams. 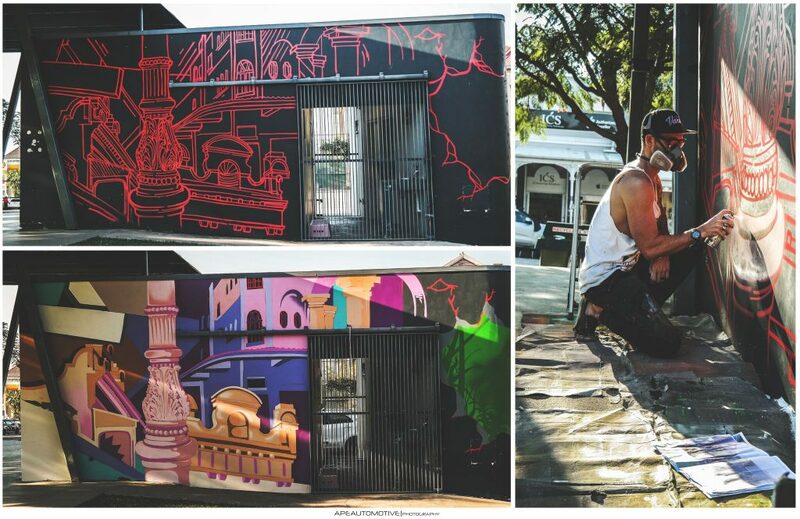 In June 2016, street artist Shaun Oakley aka: thatdamnvandal was commissioned by the Florida Rd UIP to capture this history and indeed the pulse of the future of Florida Rd in a mural painted on the bare and rather unsightly public information kiosk located at the Gordon Rd Park. While Shaun was given license to apply his creativity to the final realisation of the mural, the brief for the art work had to talk to a combination of local touch points. The history of the road as a central route through Durban, was a significant one, from it being a well-worn elephant track that took the animals on their daily trek for water from the top of Berea down to the Greyville Marsh (now part of Royal Durban Golf Course), to the road being the route for the first municipal tramline in South Africa, laid in 1892. The Edwardian architectural history and high street feel of Florida Rd was an important element that had to be brought into the design. We are Durban was born out of the desire to make a real change in Durban. The need appears so large and there appears to be so many Organisations doing “good work” and some struggling due to a lack of structure, poor management or volunteers. We Are Durban wanted to get involved with what they already had – access to people who want to help. They did not wish to recreate someone else’s organization but rather unite efforts to assist in making the vision happen and stimulate success in Durban.